Archway is a funny old place. Set where it is, barely a mile from the likes of Crouch End, Highgate and Hampstead Heath, it should be a bustling hub of people who want to live in these areas but can’t afford it. Instead, it’s a bit more like a transport hub, with the tube, numerous bus routes and the A1 all colliding in its centre and stripping away any sense of a community. However, it’s not without its charms and places to visit. It’s got the St John’s Tavern, which for my money is one of the best pubs in London, and it has Bread and Bean. A fairly new addition to the area, the owners have also just opened another café, The Spoke, on Holloway Road. Serving Union Hand-Roasted Coffee, the cappuccino is very creamy and luxurious, with a good kick of coffee and a decent serving size. And to top it off, I was asked whether I actually wanted to top it off. Not only was I offered chocolate but also cinnamon. Of course, I refused both (and got a nod from the barista for doing so). I so wanted to give this place the full five starts but just couldn’t. The front of house area is nice and light. A huge window looks out onto the bustle of Archway and a number of big sharing tables or two seaters give the café a nice community feel. The décor is understated but stylish with a changing mural on one wall. However, it has recently opened its back area to give it more seating. While this is much appreciated it’s not been done to the quality of the front. With little natural light, it’s a dingy and cold little room despite their best attempts to dress it up. 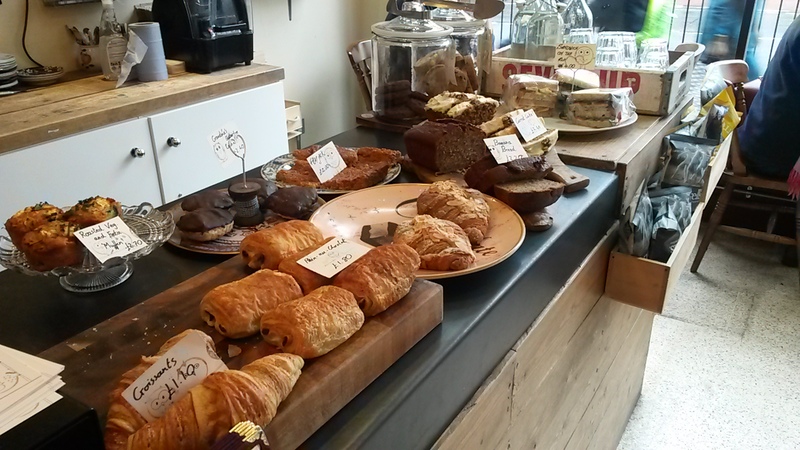 A great selection of baked goods – but where are the nachos?! Again, the menu, like most of the cafe menus I’ve seen, tends to stick to breakfast, sandwiches and baked goods. 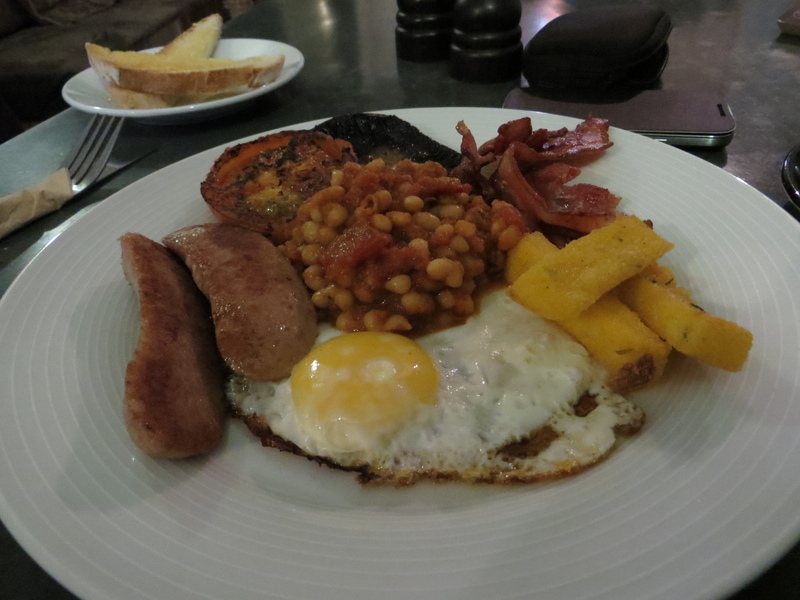 Which is fine as it’s a small venue and the full English breakfast was very tasty with homemade beans and excellent crispy bacon and a good price. I just wish sometimes smaller cafes would be a bit more daring with their food choices. Stick on a bowl of pasta or some chilli nachos. Great service. Despite having only two waiting staff on, you never felt like you were waiting around. 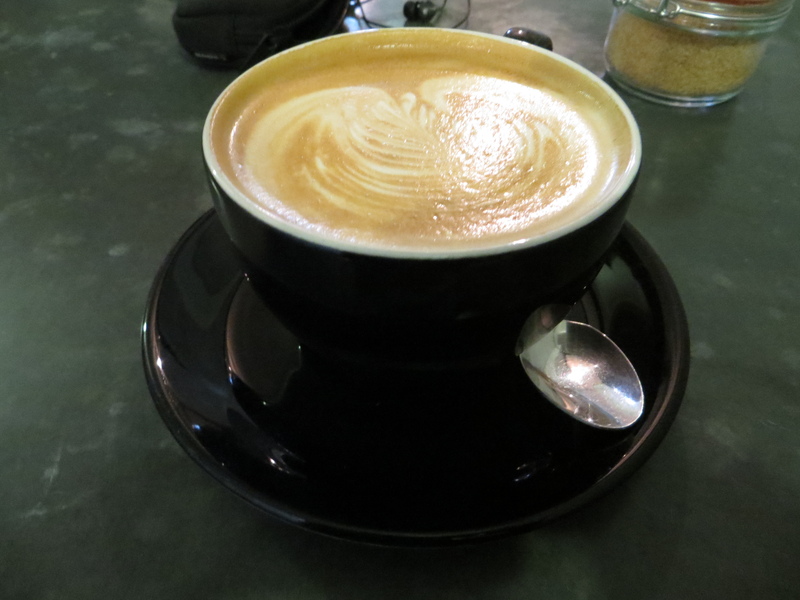 The baristas clearly knew their stuff and knocked out my cappuccino (without chocolate) in no time at all. The food came shortly after and I got a goodbye as I left. What more could a man ask for? Apart from the obligatory art for sale, there was not much else going on here. 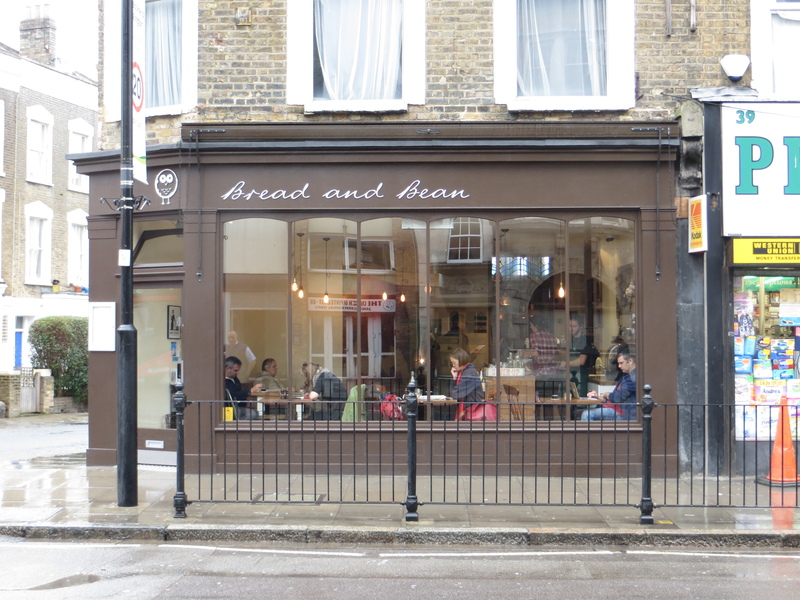 Which is a shame, because Archway needs a café like Bread and Bean to step up and help create a community atmosphere. It seems a lot of this community mindedness has gone into its sister café, The Spoke. With its excellent coffee and relaxed atmosphere, this is exactly the sort of place Archway needed. With a few more places of this quality, Archway could become a destination instead of just somewhere you pass through to get to other places.